What is the difference between Advertisers and Publishers? There’s no way you haven’t come across terms such as Advertisers and Publishers if you’ve started your affiliate marketing business. Have you found yourself in the deep waters of affiliate marketing and been feeling super lost recently? Do you get to check a lot of questions such as “Are you a direct Advertiser?” or “Are you a Publisher with high-quality traffic?” popping everywhere? Bet you’ve Googled it with no accurate answer whatsoever, right? That’s why we’re here to guide you on how this world works! By the end of this article, you’ll be able to understand how to win like a pro who stacks high into the sky! Just like any business, Affiliate Marketing has its players. In this case, we’re gonna be focusing on two of them: Advertisers and Publishers. At first glance, these players seem to be on opposite sides, competing against each other. That’s not the reality, though! Because these affiliate marketing publishers and industry advertisers are actually playing on the same side, just on different parts of the field! That content without traffic will have no value since no one will have access to it, and traffic without nowhere to land for monetization will be just a bunch of money not made! That’s why one needs the other, and vice versa! 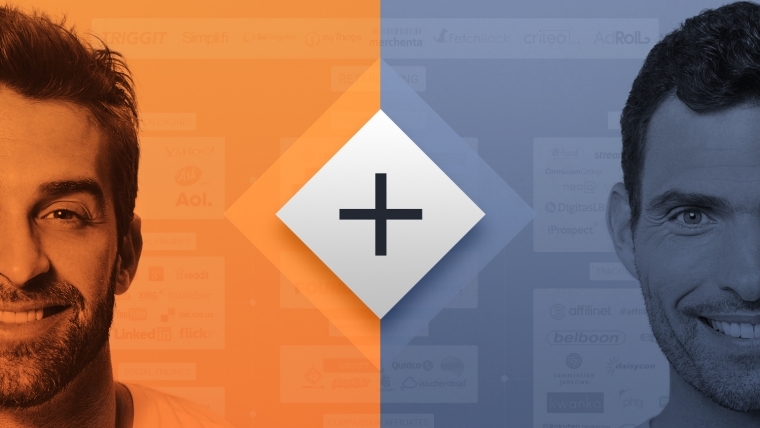 Advertisers are the owners of the offers and are in need of users for their wonderful content, and Publishers are the providers of that amazing traffic where high-quality users will convert on the offers they land in. But we’ll go deeper on this subject while you go deeper on this article! Just like we’ve mentioned before, this post is all about Advertisers and Publishers, so we’ll be focusing on them! As we’ve explained above, the Advertiser is the owner of the offer and the content provider. The advertiser is a company that has a product (CPA subscription/sale offer or CPI app/game offer) and relies on others to advertise it for them. They’re looking for users to acquire their product, which is why they trust publishers to manage the ad and bring high quality traffic to the offers. Even so, since trust isn’t enough in business, sometimes advertisers have to set some rules on how their offers can be promoted regarding traffic allowed, ads used, and how it’s gonna be actually promoted. The publisher is a person or a company that’s in charge of connecting the advertiser’s product with the end user, as they are the traffic provider. These players are responsible for the ad’s promotion and are looking for top quality offers, trusting advertisers to deliver the best product possible in order to have a high monetization rate for their traffic. You can define different types of publishers, related to what they do and how they get their traffic. Indeed, you can see that there are media buyers, who buy their traffic on ad networks, webmasters, who have their own organic traffic from web pages, and social marketers, who are the folks gathering their traffic using social networks. Bottom line is that different types of publishers will have different types of traffic which will perform differently on the offers! That’s why they should always choose wisely. So what about Affiliate Networks? Are they Publishers or Advertisers? Actually, the core business of an Affiliate Network is to act like “the middleman” between Advertisers and Publishers. Advertisers want as much high-quality traffic as possible for their offers. However, they don’t want to or can’t manage a huge pool of Publishers. These, in turn, wanna drive their traffic to the best offers available but don’t wanna waste time searching for every single Advertiser on the market. 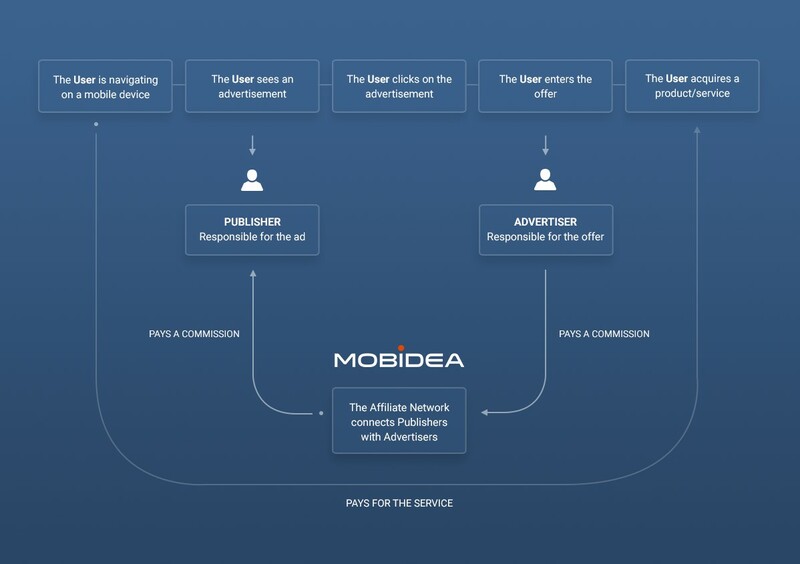 That’s why they both will rely on Affiliate Networks such as Mobidea. This is how it’s possible to provide traffic from a lot of Publishers to offers of many Advertisers and everyone can focus on their main business, bringing a higher performance to the affiliate marketing game! This is how Advertisers gain valuable help from Publishers to promote their offers: by showing the offer’s Payout! But wait! Don’t you think about how they know how much money to pay for that help? Or even how they actually make money? It’s well known that most advertisers prefer to pay on a CPA basis when they wanna acquire users for subscription offers or on a CPI basis when they wanna acquire users for an app. Nonetheless, in order for you to understand how they know how much to pay for one user of their offer, we need to refer to the user’s LTV (LifeTime Value) and also the ARPU (Average Revenue per User). The LTV is the most important metric used by Advertisers to measure the Return On the Investment (ROI) made on the offers promoted by publishers. In general terms, the LTV can be perceived as the value Advertisers got from the users who were acquired by the traffic sent by publishers. It’s usually a projection of the revenue a user will generate during their lifetime inside the Advertiser’s product/service. Advertisers often need some time to get the final LTV metric. That’s why metrics such as the Average Revenue Per User (ARPU) are also used as an indicator to define how much money the Advertiser will be able to pay to the Publisher for a new user for the product/service being promoted. Getting dizzy? Let’s simplify it. The Advertiser needs to know how much it can pay for a new user, meaning the offer’s payout. In order to do this, the Advertiser needs to forecast the total revenue generated by the users acquired during the promotion phase of the campaign. Then, they need to divide it by the predicted amount of users the campaign was able to attract. That’s how they get the average revenue per new user. Then, this average value is multiplied for the average time the user remains subscribed to the offer or active on an app. Then it’s done! The advertiser gets the amount of money they’ll be able to pay to the Publisher for each new user brought to the product! Wait! How do they earn money, then? The payout (either CPA or CPI) needs to be lower than the LTV, because this difference is the advertiser’s margin. That’s why advertisers are always concerned with quality and not only volumes! Don’t get us wrong: the higher the volume of quality users, the higher the ARPU, the higher the LTV and the more money the advertisers will get to spend on the advertisement. The keyword here is “quality” – that’s why most advertisers carefully monitor Publishers so they can identify the ones with a high Churn Rate and act accordingly, sometimes even lowering the payout or blocking the source. Wanna know more about how advertisers do their thing? We’re sure you’ve heard the expression “what goes around comes around!” quite often, right? That ancient idea needs to be brought up when we’re referring to the symbiosis between Advertisers and Publishers. An Advertiser that has offers with amazing content will get a whole lot more conversions, even on traffic with an inferior quality. Now let’s say this content reaches a high quality traffic from a really dope Publisher? Money will fall like rain. Since we’re talking about a squad game, it will rain for both sides! The Advertiser will get a lot of new users to their content and, hopefully, they’ll continue to access it, generating value on a regular basis. As for the Publisher, they’ll get that wonderful payout money for each time their traffic converts! “One hand helps the other”, right? Normally, the more quality provided, the better the payout will be. Now you know that there are different players and that Advertisers and Publishers are just one part of the whole hot ecosystem of money making! The former have the cool content and the latter have the terrific traffic! It being that this is a squad game, they need each other to get a successful result. In fact, Advertisers need to provide good content while Publishers should provide high-quality traffic. What about some cheating action? Forbidden, indeed! None of them should hoodwink their teammate. If they do try to deceive and trick, trust can be forever broken and this amazing symbiosis gets wrecked faster than a highway crash on a snowy day! For the Advertiser, the main difficulty is gonna be to set a proper payout, meaning that it has to come with a value that’ll allow them to yield a certain amount of profit, while still being appealing for the Publisher to drive traffic to it. For the Publisher, the main struggle is gonna be to get good offers that can really match their traffic and go along with their strategy in order to get some nice monetization going on, if we’re talking more about organic traffic, or get some good return on investment, if we’re talking about media buying or other promotion tools. If everyone follows the rules and knows what to do, the outcome will be sure victory for both sides (advertisers and publishers). What the heck do we mean by victory? Cash so nice like sugar and spice! Either you’re an Advertiser or a Publisher, we’re sure that, with Mobidea, you’re part of the winning team! Now that you know what it’s all about, don’t hesitate near the gate and cross that path to become a part of the Mobidea Crew! Got any questions you wanna ask about Advertisers and Publishers?